Nicholson Bucket Traps provide efficient condensate drainage of virtually all types of steam using equipment. The inverted bucket trap will operate efficiently for longer periods of time. Nicholson inverted buckets provide substantial energy savings, with lower replacement and labor costs. Nicholson cast iron inverted bucket traps are repairable for bigger maintenance savings. A lever system generates the force provided by the bucket to open the valve against system steam pressure. The mechanism is free-floating and has no fixed pivots to create wear or friction. Because the mechanism is located at the top of the trap, no dirt can collect on the orifice. 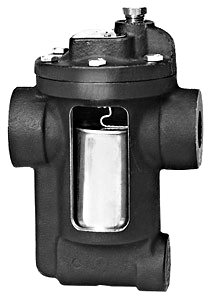 Small particles of dirt are held in solution until discharged by the full inlet pressure purging action when the bucket sinks, pulling the valve off its seat. The discharge orifice is surrounded by a liquid seal, which prevents live steam loss. Automatic air venting is provided by a small vent hole in the bucket, which allows continuous automatic air and non condensed gases to vent at saturated steam temperature. Resistant to water hammer, inverted bucket traps drain continuously, although discharging intermittently, not allowing condensate to backup. * Another outstanding feature of the Dura-Flo Inverted Bucket Steam Trap is our easy-to-install PCA (Pressure Change Assembly) kit which allows the user to change the steam trap’s pressure to accommodate a wider range of applications. * Dura-Flo PCA kits can be installed in other brands of inverted bucket steam traps at a fraction of the cost. * Dura-Flo Inverted Bucket Steam Traps are available in sizes ½” thru 2½” NPT, for pressures to 250 PSIG and temperatures to 450ْF in both horizontal and vertical configurations.